← Framing Urban Resilience within the UN Sustainable Development Goals: still gaps between theory and policy guidelines? Cities after transition: where are they, and where is the research about them? It has been already 25 years since the great political change took place in the former socialist states, which has brought also numerous changes in the fields of urban and regional development. For a couple of years, scholars working on the post-socialist cities have had an opportunity to meet and discuss their ideas and research findings during a dedicated conference. The 6th Conference on Cities After Transition (which is also known among the participants as ‘CATference’) took place in Prague at the Charles University between the 24th and the 27th September 2015. The conference was attended by a large number of scholars working both in Central and Eastern Europe and beyond. Among them, there were also many early career researchers. A number of topics were addressed during the sessions, and most if not all of them can be considered as viable not only in the context of the post-socialist cities. In particular, the topics included public space, revitalization projects, small towns, urban policies, urban tourism, and urban infrastructures. There were also sessions devoted to issues like the theorising of the transitions, the application of different kinds of quantitative data, as well as a special situation about recent developments in the Ukraine. I personally contributed to a session about the housing issues, which was in my view a very informative review of issues emerging in different countries. It was really possible to better understand the different contexts, and thanks to this to better position one’s own experience. With contributions varying from informal house extensions in Georgia’s capital Tbilisi to restructuring programmes in East German shrinking city of Halle, we had a truly variegated picture of the post-socialist transition. By the way, maybe it would be better to speak about transitions? What is even clearer to me after the conference than before is that we need to take into account the different context of particular countries. Socialism tended to equalize things, but it was imposed over very different national conditions, and to some extent also had a somewhat different face in each place. Sometimes by simply using the label ‘post-socialist countries’ we have a tendency to think about a more or less homogenous region. It is, however, a strong oversimplification, which results maybe from the fact that the differences despite their apparent visibility are not that very much explored, not to say they are in a way systematized or theorized. Apart from a rich scientific programme, all the participants of the conference were also offered to participate in one of four trips in the various parts of Prague. I decided to take part in the trip to the district of Holešovice, which attracted me with a promise to see some recent transformations of a formerly industrial area. My expectations were more than met, because during the trip we could both feel the spirit of the past retained in old apartment houses built in different forms of the cubist architectural style, as well as see ‘new life’ inserted into old spaces. 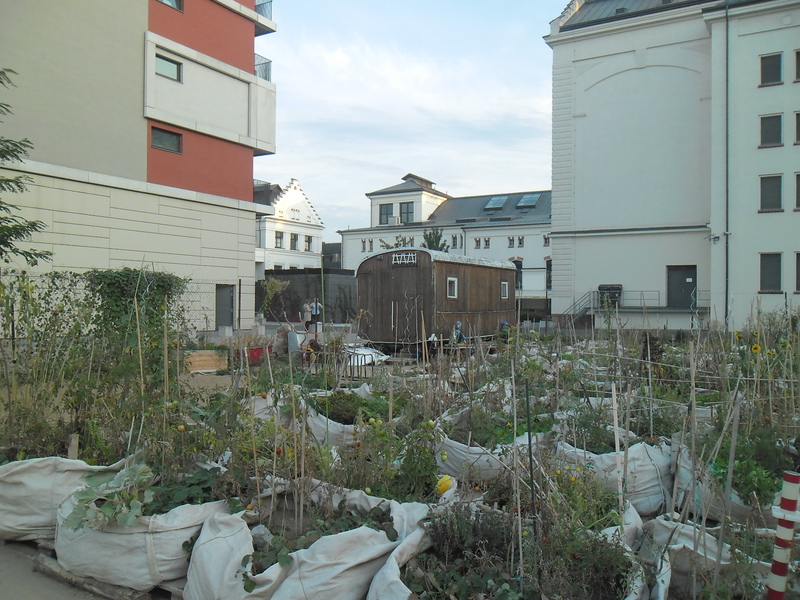 The examples of the latter include lofts, art centres, clubs, ateliers, and even urban gardening (see photo). It was really a chance to see a less known face of the Czech capital. To sum up, these were really three very productive days in Prague. Many thanks to the organizers and all the participants for creating the event. The next occasion to reflect on the situation of the post-socialist cities will be in two years in Kiev, where the next CATference is going to take place. Urban geographer, postdoctoral research fellow at Gran Sasso Sciencie Institute in L'Aquila, Italy, and assistant professor at Adam Mickiewicz University in Poznań, Poland (currently in sabbatical). Research interests include urban and housing policies, with a particular focus on the post-socialist context. This entry was posted in Events reports, Planning, city, and society and tagged communication, conference, dissemination. Bookmark the permalink. 2 Responses to Cities after transition: where are they, and where is the research about them?